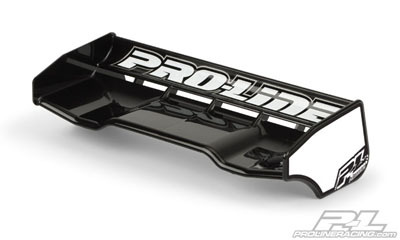 Proline High Downforce Black Wing for 1/8 Buggy Discounts Apply ! PRO602303 - Proline High Downforce Black Wing for 1/8 Buggy. This is Pro-Line's 1:8 High Downforce Wing. The wait is over 1/8 fans! Pro-Line releases a second version of its popular 1/8 wing kit in a high downforce version. Higher downforce is produced from two new design features. The first is a lower deck height on the outer portions of the wing. This creates more airflow to the rear element. The second is a more vertical rear element. In addition to the higher downforce design, it also comes complete with body clips, body clip washers, and a full detail decal sheet including number plates.